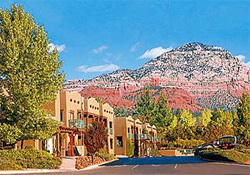 Be Pampered at The Southwest Inn in Sedona, Arizona for a week or mini-vacation where only quality and personal attention makes your stay with us a memorable experience . 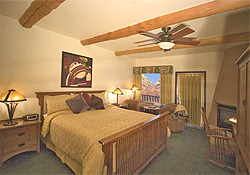 Our spacious, beautiful rooms offer the ultimate in Santa Fe style decor. Swim in our pool or outdoor whirlpool spa and relax. Enjoy the view the spectacular red rock vistas from your room's deck or patio. Our Romance / Honeymoon package includes 2 nights in a romantic first floor room with a king sized bed, gas fireplace and jetted tub. For our single guest our friendly staff will be there to help you . Our concierge will make suggestions and arrange tours. You will never feel lonely. Family guests may have connecting rooms. There are many organized tours suitable for your visit. Jeep tour companies, helicopter companies and tour operators will welcome you and your family. Business meeting and seminar at Southwest Inn are new. We offer a beautiful boardroom with a conference table seating up to 12 people. Our conference room has large windows with excellent red rock views. Enjoy breakfast in our breakfast room, catered lunches, dinners or just sandwiches or snacks is available. The serenity of our uncrowded hiking trails and an adventurous off-road jeep tour are there to be enjoyed. 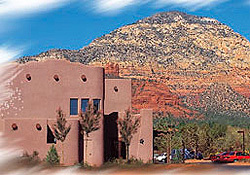 Sedona, Arizona offers premier tourism, recreation, resort, arts and cultural, and retirement centers, fine restaurants, outstanding shops and diverse art galleries. The beauty and the climate make sightseeing and hiking popular, golf and tennis are a year-round activities for you to enjoy all that Sedona has to offer. Two hours from the Grand Canyon and two hours north of Phoenix to . 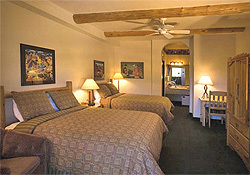 Reserve now at the Southwest Inn.